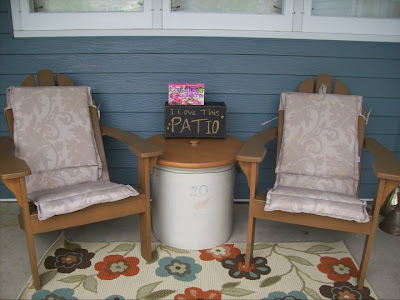 I hate to already start dreaming of summer here in Northern Minnesota when we have several months of winter left and probably a cool spring, but Donna at Funky Junk is having a themed link party on "Best Outdoor Projects" of 2011. I didn't have a blog yet when these photos were taken, but they were indeed from 2011's beautiful summer. As you walk up to my entrance, I have this neat little covered area between my house door on the right and my attached garage door on the left. The "front patio" is a great place to sit in the shade or watch it rain, and I have added a white overhead fan for really hot weather. 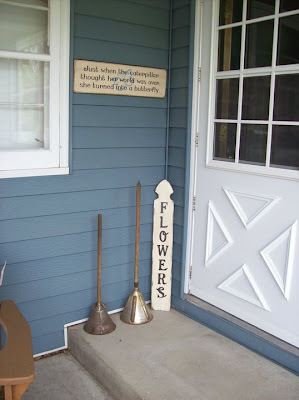 Up one step from the patio is the front door, with signs and laundry plungers. I used to have a third adirondack chair here, but left it in the garage when I found this white chippy little chair last spring. This is the door into our garage. This is outdoor space is my summer "favorite place"! I love your favorite summer place. I also envious your is covered. My favorite place is out by the garden under a large shrub, but not covered, so wish I could sit out there while it rains. Live that you added a overhead fan to cool yourself off on hot days. I also live in the midwest - IL, and we got hit with snow. So it will be awhile before we outside. You have a very cozy space, warm and welcoming. My fingers are crossed that you will share over at Sunday's Best Par.tay going on tonight! Now following you! Thanks, Cathy. I will have to check out your party! Beautiful curb appeal. Looks like a wonderful place to sit and watch kids or the rain, like you said. Thanks Sara. I will check out your blog as well. I don't have any kids to watch anymore but I love to read out there. 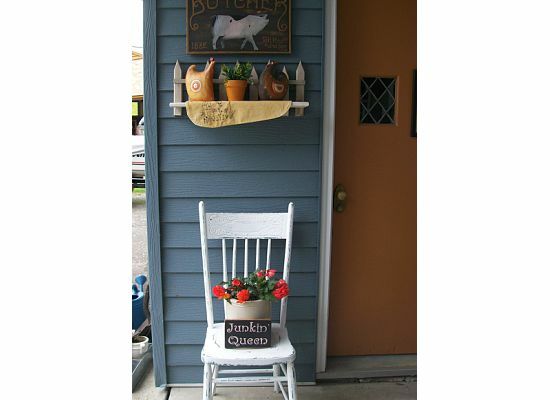 How fun is this porch! I wish I could see pictures of the whole house! I bet it's adorable! PS Come show this off at my place on Wednesday if you can! Thanks for your nice comments. I will check out your place. 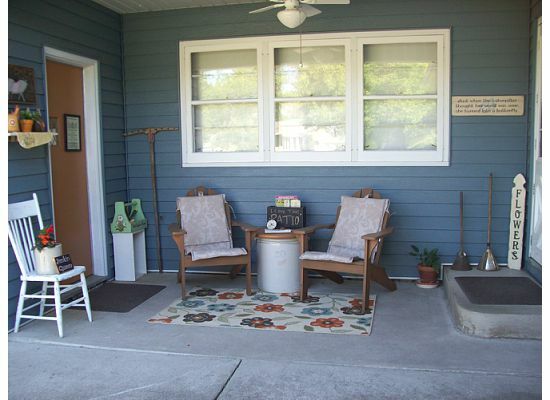 This space gives you great curb appeal. Your porch is so warm and welcoming. Love it. So glad you shared at Sunday's Best. Hope you'll come back again. What an inviting entry. So charming. Wowza, your place does have curb appeal. We are having a warm winter but we don't sit outside in winter. Even though the summer spot is rain protected the snow blows in there, so all my stuff gets put in a storage shed for the winter. Thanks for you comments! Thanks so much for linking up! What a great space! Thanks Melody. I will be back to your party!